One night this week, I actually prayed that God would silence me and that I would be unable to speak. This is slightly adapted from Luke 1:18-22 wherein Zechariah, upon a visit from the Angel Gabriel, hesitated in his faith and questioned the Angel who had been sent directly by God. Because Zechariah didn’t believe, he was silenced until his child (John the Baptist) was born. My prayer, however, was slightly different. I didn’t ask to be silenced because I doubted, rather I asked to be silenced because sometimes being a messenger of the Word is a messy, messy business and I need, rather I wanted, a break. John warned believers in 1 John 3:13, “Don’t be surprised, dear brothers and sisters, if the world hates you.” Even though we have warnings like this, it hurts when fellow Christians, friends and family are aghast at what you might say or believe. For example, Christians and non-Christians raked Kirk Cameron over the coals this past week for his comments about gay marriage. He was asked what he believed and he answered, very matter-of-factly. Not once, did he say that he hated the gay community. No, instead, he said, “I think that….” Big difference. However, our twisted world takes those comments and turns him into a homophobic, bigoted, radical Christian…all in the name of tolerance. The same groups who tout tolerance and freedom are basically telling Kirk (and anyone else who believes the way he does) that they can’t say those kinds of things. And if they do, they are haters and not loving people. Really? Who then is slinging the intolerance now? The great thing about freedom is one has the right to say what they believe. So, that actually means that BOTH sides will get to say what they believe. Not just one side and not just the other side, but BOTH. I’ll write that again in case you missed it….BOTH. This is only one example, but there are many. And, I get that people will want to respond to whatever was said, and then someone will want to respond to that and so on. It’s a vicious cycle that the devil loves to dance in. And, his legs never get tired. Somehow in today’s world we have forgotten what “love” means in biblical terms. The “love” in love one another is not phileo (an affection for; a fondness in the heart), it is agape (a self-sacrificing type of love; purposely seeking the best for one another). Jesus epitomized a life of love (agape) – he sacrificed himself for us on the Cross. However, he didn’t shy away from controversial things or people. Jesus wasn’t sent to save the righteous, but to save the lost sheep of Israel. It is true that he hung around sinners, but he didn’t do it so he could be life-long friends with them at an arms distance. No, Jesus did it because he knew they needed him and he needed to offer them the chance to repent and seek forgiveness once and for all. 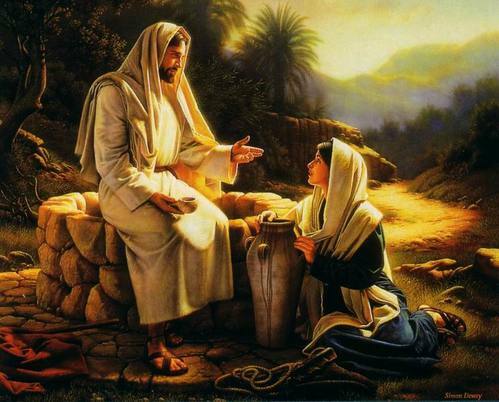 Take for instance the woman at the well in John 4:1-42. In a matter of minutes, Jesus had exposed this woman’s past and present sin. He didn’t sit back and say, “Hey, this woman looks lonely. I am going to meet her at the well everyday for a year and just be friends with her. Maybe then, she’ll see how nice I am and want to hear about My Father.” No, it was mere minutes that she experienced the life-changing words given to her by Jesus. And in her boldness, she ran back to her village and exclaimed to everyone what had happened to her and whose presence they were in. She didn’t hide this secret from the people in her village and hope that people saw the change in her. Why should believers today be any less bold than either Jesus or the woman at the well? Can you imagine this scene today? Can you imagine the press coverage that would take place if an evangelical walked into someplace and did something like this today? In the context of Jesus’ time, this was radical. Look at my Servant, whom I have chosen. He is my Beloved, who pleases me I will put my Spirit upon him, and he will proclaim justice to the nations. He will not fight or shout or raise his voice in public. He will not crush the weakest reed or put out a flickering candle. Finally he will cause justice to be victorious. And his name will be the hope of all the world. However, let us not lull ourselves into a false belief that by loving someone we mean condoning or agreeing with their lifestyle. Jesus did not come to this earth to be friends with people or blindly accept what they were doing. No, he came so that the chosen people of Israel would know who he was, repent of their sins and be blessed with salvation through him. Jesus didn’t go chasing after the rich young man who was sad and didn’t want to sell his possessions (Matthew 19:16-22). He didn’t say, “Oh wait, I am sorry. Did I hurt your feelings? I didn’t mean to tell you that you had to change everything, sell everything, leave everything….I was just kidding. What do you want to give up in order to follow me?” Nope. He let him go away. Jesus sent out his twelve disciples with these words, “Look, I am sending you out as sheep among wolves. So be as shrewd as snakes and as harmless as doves.” (Matthew 10:16) Jesus had compassion on the masses that he spoke to not because they were people, but because they “were confused and helpless like sheep without a shepherd.” (Matthew 9:36) Jesus didn’t seek out the massive crowds, they sought him ought, begging to cling to him, begging him to heal. These were God’s chosen people who had lost their way, who now wanted to get back in the game…at least for that moment in time. They had faith. The Bible doesn’t belong to a secret club, but it does take wisdom to learn the ways of God. However, it doesn’t take wisdom to accept Jesus Christ as your Savior – only a willingness to repent, ask forgiveness and surrender. Believers will have hiccups along the way, no doubt about it. We will say things we shouldn’t for sure. But one of the differences between a believer and a non-believer is that we will repent and seek forgivenes. We have to remember that each one of us has a totally different story. Some will preach with such an evangelical zeal because they have been on the ledge of the fiery furnace of hell. They know what that personally feels like. Others, preach from a life of nothing but blessing. Their lives have been so blessed because they have walked the straight and narrow path forever and know nothing else. We should, no matter what our stories are, have faith. A faith that God can do anything and will do anything. If the disciples, who actually walked with Jesus, waivered and had little faith many times, you can bet that we will too. Life is hard. People will mock us. People will hate us. Satan will plant seeds of doubt in our brain (if we let him). It is ugly. But be reminded, we live in this world, but we are not of this world. Stand firm on your rock. Love others with love (agape) and love them enough to sacrifice your own sense of comfort and possible backlash because you know that if they don’t hear God’s Word (His Word, not a version you made up), repent, confess and surrender their life, they will not inherit the promise of the Kingdom of Heaven.